The Godfather: Part II tells two stories – firstly, the early days of Vito Corleone (played by Marlon Brando in The Godfather and Robert De Niro in this film) as he arrives in America as a child and his rise to power in New York; secondly, Michael Corleone’s (Al Pacino) rise and rise as he has taken over the family after his father’s death. This was another mammoth effort of a film – two hundred minutes long. And really, it could easily have been two films. Actually, it would have been awesome as a series. Or a couple of series. As a whole, it was long, but great. I really enjoyed this one a lot more than the first. I especially enjoyed the scenes in the early days in New York. Some of the scenes in Cuba lost me a little, but I didn’t mind it too much. 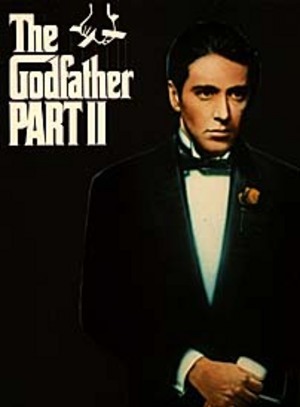 The Godfather : Part II won Oscars for Best Picture, Best Actor in a Supporting Role (Robert De Niro), Best Director (Francis Ford Coppola), Best Writing, Screenplay Adapted From Other Material (Francis Ford Coppola, Mario Puzo), Best Art Direction – Set Decoration, Best Music, Original Dramatic Score and was nominated for Best Actor in a Leading Role (Al Pacino), two nominations for Best Actor in a Supporting Role (Michael V. Gazzo, Lee Strassberg), Best Actress in a Supporting Role (Talia Shire) and Best Costume Design.